The Essa Stallions are proud to announce the signing of F/D Malcolm Gamelin! 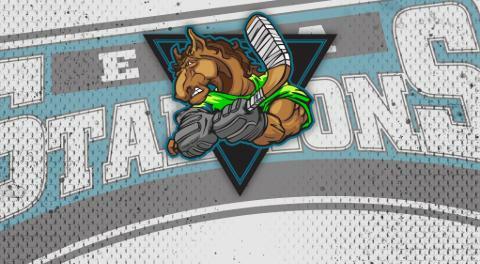 Malcolm, comes to the Stallions after playing this first half of the season in the NOJHL with the Espanola Express. He recorded 1 goal and 4 PIM in 14 games while playing for Espanola. Gamelin, a 6"1, 175 lbs, 2000 born from St. Calixte, QC will be a much needed player around "The Barn". "Adding Malcolm to our squad for the rest of the season is a huge help for us. He brings the ability to play upfront if we need him, or the back end. Having the flexibility and ability to adapt to where we need him will be a big help for our team. He's a good skater, and responsible defensively. He's going to help us, and we can't wait to get him out there on Friday night" said Head Coach and Director of Hockey Ops Sylvain Cloutier. "We've had some injury issues as well as some bad bouts with cold/flu season around these parts. Some key guys haven't been in the lineup due to that, so Malcolm is a welcome addition to our lineup. He's going to fulfill the roles we need covered, just like everyone else who are required to step up in big moments. The deadline may be down the road, but it is still quickly approaching. With the signing of Gamelin, and our guys coming back off the IR, it'll be like making deals; key ones at that. We're looking forward to having everyone back, and getting Malcolm into the lineup right away" said GM and Assistant Coach David Lang. After taking both games this past weekend, a 6-2 victory over Seaforth on Friday night, and a 7-2 victory over Maniwaki on Saturday night, The Herd turn their attention to a big back to back set this weekend. Friday night, they travel to Gravenhurst to take on the Muskoka Anglers. Saturday night, will see the battle for CPJHL supremacy, as The Stallions will welcome the 2nd place Grey Highlands Hawks to the Angus Rec Centre. These teams have split the season series this year, with both road teams getting the victory. See you in Gravenhurst on Friday! Welcome to "The Herd" Gams!!! !